Historians agree: The moment the first full-circuit roller coaster opened at Coney Island in 1885, the need for speed was unleashed. Ever since then, ride designers have been looking for ways to one-up each other to give coaster fans a bigger rush. In recent years, only all-steel coasters could attain blood-curdling speeds. But now Dollywood has introduced the world’s fastest wooden roller coaster – with spine-tingling speeds of up to 73 miles per hour! Appropriately enough, it’s called Lightning Rod, and it’s open daily at the Dollywood Theme Park in Pigeon Forge, Tennessee. Built to Dolly’s exacting standards to the tune of $22 million, this world-class attraction represents the single biggest investment in Dollywood history. According to recent patrons, the investment has more than paid off, as state-of-the-art technology delivers the ride of a lifetime. 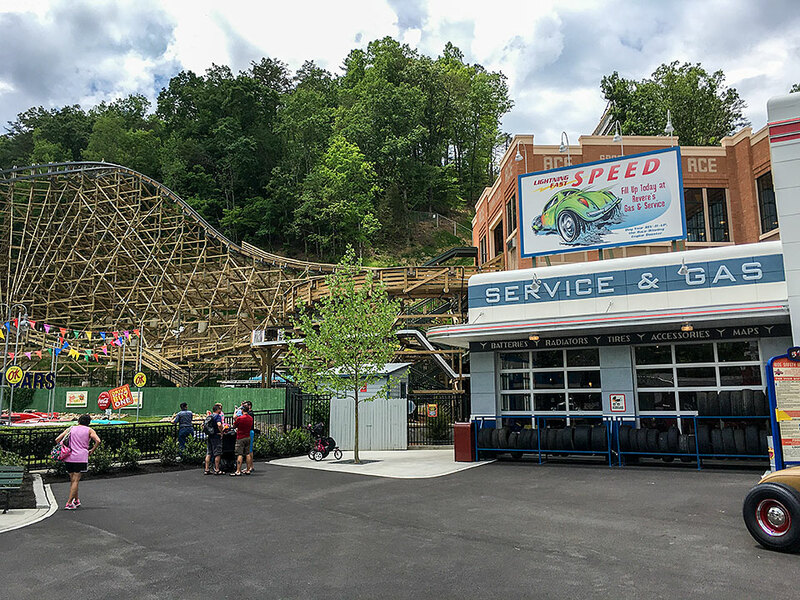 Located in Dollywood’s famed Jukebox Junction, Lightning Rod was inspired by 1950s hot-rod culture. Each colorful coaster train resembles a vintage hot-rod, with twelve 2-person cars (for a total of 24 passengers). But don’t be fooled by the ’50s decor: This retro rockin’ roller coaster leaves yesteryear’s rides in the dust. The typical wooden roller coaster chain lifts its passengers s-l-o-w-l-y up a hill before releasing them into the traditional down-and-up ride. But Lightning Rod uses a state-of-the-art launch system to rocket you into your most electrifying ride ever along 3,800 feet of twist-&-turn track. First, you’ll zoom up the launch hill – more than 20 stories high – at zero to 45 mph in seconds flat. At the top, you’ll be briefly airborne twice before plunging 165 feet to your first dramatic drop. As you race around the massive track, you’ll reach a peak speed of 73 mph – faster than any other wooden roller coaster anywhere! If you love heart-pounding rides, you won’t want to miss out on Lightning Rod. It’s perfect for teens and adults with a taste for thrilling adventure. If you prefer slightly quieter pleasures, never fear. You’ll find endless opportunities for late-summer fun in the Pigeon Forge / Gatlinburg area – from foot-stompin’ concerts and festivals to dinner theaters, magic shows, and more. Not to mention gorgeous drives and hikes through some of the most magnificent scenery in America. All topped off with delicious dining anyway you want it, from down-home Southern cookin’ to elegant fine cuisine. Best of all, you can find the perfect Smoky Mountain cabin just minutes from all the excitement. At Volunteer Cabin Rentals, we offer something for every taste, from rustic chalets to opulent luxury cabins. You can be as secluded or social as you want… and enjoy all the amenities you crave, from hot tubs to billiards and foosball. Not to mention Wi-Fi, big-screen TVs, and fully stocked gourmet kitchens. One bedroom to 8, it’s all here in gorgeous Wears Valley, surrounded by stunning mountain views, within a short, easy drive of Gatlinburg, Pigeon Forge, and the Great Smoky Mountains National Park. Contact us now to learn more!